Use TB2QBC0 to reference this item. 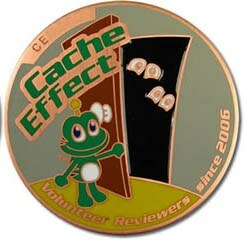 The Cache Effect geocoin is about a secret volunteer reviewer revealing himself. Cache Effect can also mean: Letting this coin travel to spread the message of Bike Awareness. Speeding, inattention, inexperience, fatigue, drugs and alcohol and illegal manoeuvres are given reasons for causing accidents. YOU have the power to do something to control each of these factors. Give a good example while driving/riding yourself. Practice what you have learned in your driving lessons. Drive save and watch for the more vulnerable travic participants. Start a discussion and make people aware they can help save lives to keep to the rules, be alert and drive save. Imagine what the 'Cache Effect' of spreading this message can be. Since this coin is no longer in the cache witch it has been placed in, I consider it as lost. Found this in Rock of Discovery, but had to wait to log it until previous people who had it logged it in. Will drop it off soon in another cache! Retrieved after a visit to the UK Mega event.